Programs that show a preview include Windows Mail and its predecessor Outlook Express. You may find it useful and convenient to have more than the subject appear ​for each message, read or unread. But for security, it is best to disable this feature. Learn how to disable it for Windows Mail, Outlook,com, Outlook and Outlook Express, or at least to turn off automatic loading of remote images. In Mail for Windows 10, click on the Settings icon, the cogwheel. 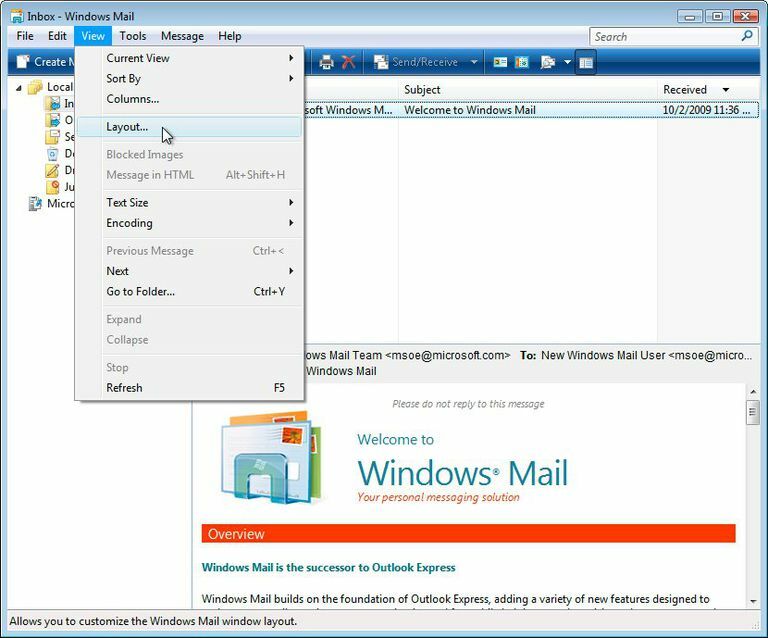 For older versions of Windows Mail, here is how to turn off the message preview pane. Select View | Layout... from the menu. Make sure Show preview pane is not checked. You can also click Apply to put the new settings into effect without closing the configuration dialog. If you are using Outlook.com, select the Mail Settings icon (the cogwheel) and then select Display Settings. Under Choose whether to show preview text, check the Hide preview text box. You can also choose to hide the reading pane. in Mail Settings, Display Settings, Reading Pane, check the box for Hide reading pane and then click OK. Now you will only see the message subject and you will have to select it to load and read the message. See how to turn off the Outlook Reading Pane in the default folder views in Outlook 2016 and Outlook 2007. To turn the Reading Pane off in Outlook 2016, Outlook 2013, and Outlook 2007, you have to do it folder by folder. For each folder, select View > Reading Pane > Off.Similarly, you can select View > AutoPreview > Off but you must do it folder by folder if you don't want to see the three-line preview for each unread message. Back to the View tab, Current View group, click Change View. Now click Apply Current View to Other Mail Folders. Check the folders to which you want to apply the view. If you have subfolders, check the Apply view to subfolders box as well.